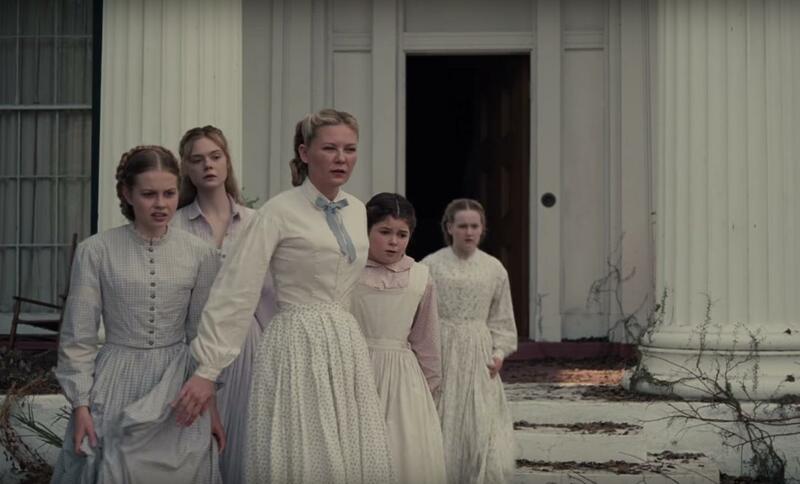 Early reports promised that The Beguiled would be a top rank film from Director Sofia Coppola who was named this year’s Best Director at the Cannes Film Festival. So off I went in happy anticipation that turned quite quickly to disappointment. It’s 1864. In an old southern Virginia mansion that had served as a girls’ boarding school before the war, a handful of students, a teacher, and their headmistress are stranded because they have no place to go. The movie opens beautifully as a young girl is gathering mushrooms in a forest of majestic trees whose enormous branches shut out the sun. As Amy’s (Oona Laurence) peaceful walk in the woods goes on just a bit too long, we realize in scary anticipation that something is about to happen. It does. She stumbles across a wounded Union soldier (Colin Farrell) and helps him back to her school where headmistress Miss Martha (Nicole Kidman), teacher Edwina (Kirsten Dunst), rebellious student Alicia (Elle Fanning) and the younger girls discuss what to do about this enemy in their midst. Miss Martha washes and stitches his serious leg wound and all agree they will shelter him until he recovers. Still afraid of him, they lock the soldier alone in the room and decide to send him on his way as soon as he can walk. By then, the movie is wrapped in stiff formality. With the sounds of war in the distance, and a wounded soldier in their midst, it is almost laughable that teachers and students are dressed immaculately throughout in perfectly ironed long white dresses while they move about with slow formality. As time passes much too slowly forward, sexual attraction surfaces, then erupts. We welcome this last half hour because it punctures the stilted propriety that has enveloped us for an hour. Sofia Coppola did interesting work here by observing the reactions to the emergency of three women of different ages. Nicole Kidman, Kirsten Dunst, and Elle Fanning react according to age but during the first hour they are too much alike, too contained for the audience to get to know them as individuals. We try but can’t succeed in piercing the prohibitive formality. Colin Farrell, on the other hand, is credible during the first half only to undergo a character change that, while understandable on one level, is beastly and prolonged on the other. Director Coppola’s filming is grand as she creates the atmosphere of seven women isolated in the woods during the Civil War. The singing of the young girl who opens and closes the movie is extremely moving. For the first hour, the actors seem trapped in their silence while the whole goes from mild mannered propriety in one crisis to hysteria in the next. Feeling somewhat sad to be going against positive advance word, I’d love to hear from anyone who wants to talk about this movie lover’s dilemma. Am I crazy? This review was posted on July 1, 2017, in Drama, Western. Bookmark the permalink.